Hypertension: Blood pressure is essential as it helps your blood move around your body. Blood pressure may change as per your daily activities or worry. Normal blood pressure is calculated in between 120/80 and 140/90. But if your blood pressure is consistently outside of the given range of 140/90, then we called it as hypertension. 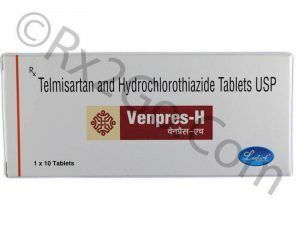 Telmisartan HCTZ treat hypertension and gives relief from its symptoms. How do Telmisartan and HCTZ work? Telmisartan belongs to the class of drugs called as angiotensin receptor blockers (ARBs). Above drug is a combination of two drugs. Telmisartan – Angiotensin II is responsible for the tightening of the blood vessels. The drug blocks the synthesis of Angiotensin II. This leads the blood vessel to relax. The blood flows freely and lowers the blood pressure. Hydrochlorothiazide (HCTZ) – The drug is also called as “Water pills.” It is a diuretic. It increases the output of the urine remove excess fluid. Thus it lowers the blood pressure. Together they show a great effect to lower Blood pressure and treat hypertension. How to take Telmisartan- HCTZ-? The drug is available in the form of a tablet of strength 40/12.5 mg. It is an oral tablet to take one time in a day. Each tablet contains 40 mg of Telmisartan and 12.5 of HCTZ. Adult: 1 tablet in a day. Children: The safety and efficacy are not established. You can take it with or without food. Consume it with a glass of liquid. The drug shows the hygroscopic property. Take it out of blister just when you want to consume it. Avoid taking the tablet within 4 hours of your bedtime. This may make you get up to urinate. The dosage may change. Your doctor may adjust your dose. It depends on your medical condition and response to the treatment. Take the dose at the same time each day. What are the uses of Telmisartan- HCTZ? The drug treats high blood pressure (hypertension). It relaxes the blood vessel to lower blood pressure. HCTZ removes out extra fluid through urine. This also helps to reduce blood pressure. Above combination of drug works when Telmisartan alone do not give results. The medication may also be used to treat heart failure. Relaxed blood vessels allow easy flow of blood through vessels. What are the precautions in taking Telmisartan- HCTZ? Do not use the medicine in following cases. Hereditary problems of galactose intolerance. Pregnant or plan to be pregnant. Low potassium level in the blood. Allergy to the above drug. Discuss with your doctor regarding these conditions. He may decide how to take the medicine or not to take it in certain conditions. Continue to take medicine as per the prescription. Inform your doctor regarding all the medicines that you take. This will help you to prevent drug interaction. Generic medicines are copies of brand-name drugs. They contain same active ingredients. The generic drug doesn’t have to spend as the manufacturers of the brand. Brand named drugs are invented. This process needs to put a huge amount of hundreds of millions of dollars. This increase the cost of the Brand drug. Thus, we can sell the cheap generic drug. Cost of Generic Telmisartan- HCTZ. Pack of 30 Tablets of 40/12.5 mg costs $ 41.99, per unit cost is $ 1.4. Cost of Brand Micardis HCT. Pack of 30 tablets of 40/12.5 mg cost $ 217.14, per unit cost is $ 7.24.